It’s curious how history tends to discount maternal family lines when assessing nationality, but it’s come in handy for various royal families over the years, most noticeably the Saxe-Coburg and Gothas, who changed their name to Windsor in 1917, to disguise the truth that they were more German than a frankfurter sausage. Of course, in the case of George V, the king of Britain at that time, he was more Danish than anything else, through his mother, Queen Alexandra, although that might depend on how German the house of Schleswig-Holstein-Sonderburg-Glücksburg was. Yes, this nationality assessment – it’s harder than it looks. So perhaps the world can be forgiven for regarding the famous Fabergé jewellery design family as Russian, even if the bit about them being the descendants of fleeing French Huguenots is often thrown in – to explain the accent in the surname more than anything else. But ignore the mother it does, and in the case of the creator of the famous eggs, Peter Carl Fabergé, when he asked for mor, it was Charlotte Jungstedt, the daughter of a Danish artist, who answered in the affirmative. The Danish connection to the eggs does not end there, as Fabergé’s main client was Russian Empress Maria Feodorovna, who’s better known in these parts as a Copenhagen cinema. To bring us full circle, if that’s possible in the convoluted machinations of 19th century European royal history, Princess Dagmar of Denmark was the younger sister of the aforementioned Alexandra of Britain and daughter of the father-in-law of Europe himself, Denmark’s Christian IX. And it’s even said that the eggs were inspired by one owned by a Dane too: an ivory specimen that was the property of Dagmar’s aunt, Princess Vilhelmine Marie of Denmark and Norway, the daughter of Frederick VI, which Dagmar admired (‘coveted’ might a big strong in this case) as a child. Fast-forward to 1885, and Emperor Alexander III of Russia is wondering what he should get his Danish wife to mark 20 years of marriage. Now, nobody knows for sure whether it was a complete surprise to Dagmar (we like to think that she was sleep-taking: “I had an egg in Denmark” – imagine the voice of Meryl Streep if it helps), but Alexander presented her with a golden Easter egg, which when opened revealed a golden yolk containing a golden hen containing a diamond crown. Known as The Hen Egg, this would be the first of 50 Imperial Easter eggs (of 52 made) presented to Dagmar and her daughter-in-law Alexandra, as when Alexander unexpectedly died at the age of 49 in late 1894, his heir Nicolas II continued the tradition, but doubled the order to present eggs to both his wife and his mother. In total Dagmar received 30 during her lifetime, and it would have been more if the Russian Revolution hadn’t scrambled all the gift-giving in 1917. It remains one of seven Imperial Eggs that are officially lost, and there is no record that the egg ever left Denmark. As a 2014 episode of the TV series ‘Raiders of the Lost Art’ remarked: “Something is amiss in the state of Denmark.” Even more curiously perhaps, of the seven lost eggs, all seven were gifts to Dagmar. When Dagmar eventually left Russia aboard the HMS Marlborough in 1919, it is speculated that several of the missing eggs might have been in her luggage. Certainly the 1916 egg, The Order of St George, was in her possession (along with two Rembrandts) as she eventually left it to her daughter Xenia when she died in Denmark in 1928. But how many of the missing seven might she have had? After all, she was the rightful owner. Well, three of them – Cherub with Chariot, Nécessaire, and Hen with Sapphire Pendant – have been accounted for in records following Dagmar’s departure from Russia. And another, the Empire Nephrite Egg (1902), also known as the Alexander III Medallion Egg, was listed by Dagmar’s entourage as being among her personal belongings at the Gatchina Palace in St Petersburg in July 1917. She had left the capital, never to return, a year earlier. But two of them, along with Royal Danish, have not. No post-1917 records exist of another egg with significant personal connection to Dagmar, the Alexander III Commemorative egg from 1909, as well as The Mauve (1897). For many years, there were eight missing imperial eggs, but then one showed up in 2012, the 1887 edition, the Third Imperial Egg. An American metal dealer had bought it a decade earlier for approximately 80,000 kroner for its scrap value, but was then told he had overpaid for it by prospective purchasers and it sat in his kitchen for years. Eventually he googled it, discovered a Daily Telegraph article asking if this very egg was on your mantelpiece, and contacted a London jeweller, Kieran McCarthy from Wartski, who flew out to the States to verify the discovery and pay 200 million kroner on behalf of a collector. So the question remains: is there a Fabergé egg sitting around somewhere in Denmark overlooking a Jensen’s Bøfhus next to some stale cinnamon snails? CORRECTION: This story has been updated to amend a claim that the Empire Nephrite Egg could have been in Dagmar’s possession in 1917 when she left the Gatchina Palace in St Petersburg. It was not, as she left in 1916. A 1917 inventory proves it was still at the palace. Many thanks to Nick Nicholson from Freeman’s Auctioneers & Appraisers for pointing out the error. 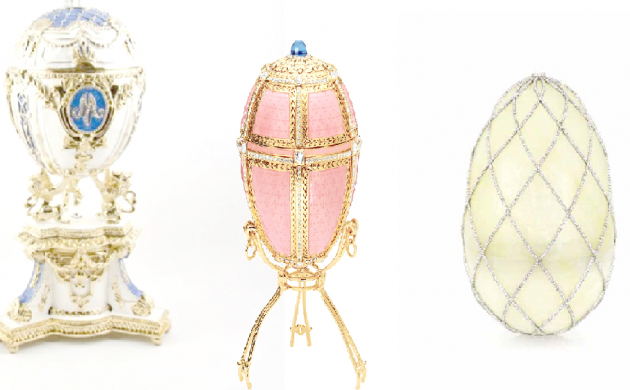 The 1892 egg, the Diamond Trellis Egg, contained an automaton (Fabergé’s first) of an ivory elephant covered with precious stones – a tribute to Denmark’s Order of the Elephant. Likewise discovered at the Kremlin in 1917, it can today be seen at the Houston Museum of Natural Science. Until two years ago it was believed the automation had been lost, but it was then confirmed it had been in the collection of the British Royal Family since George V purchased it. Nice of them to let us know! The 1890 egg consists of ten watercolours of mostly Danish landmarks painted by the Russian artist Konstantin Krijitski. Among those depicted were: Bernstorff Palace, Kronborg Castle, Amalienborg Palace, Fredensborg Palace and the Emperor Villa at Fredensborg Park. Two imperial yachts and three Russian palaces complete the ten. Discovered at the Kremlin in 1917, it was sold abroad in 1930 and eventually found among the private collection of a deceased New York lady in 1971. Today the egg can be seen at the Metropolitan Museum of Art in its adopted home. At 229 mm tall, the 1903 egg (also known as the Danish Jubilee Egg) was one of the largest made for the Romanovs. True to its name, it contained miniature portraits of Dagmar’s parents, Christian IX and Louise of Hesse-Kassel. Only one photograph of it exists today.